The ASA’s Dementia Friendly Swimming Project has been rolled out to its second city today with a launch at East Manchester Leisure Centre. The dementia friendly swimming sessions are being run in partnership with Manchester City Council and supported by GLL. The project aims to create a network of pool that will help to enhance the swimming experience of those living with dementia and their carers. Part of a three year project, the City of Manchester was chosen as one of two areas to run a pilot programme before it is rolled out nation-wide. The ASA and Manchester City Council will be working in close partnership with GLL, health care professionals, community groups and a number of other organisations across the city to develop knowledge and understanding around the swimming needs of those living with dementia. 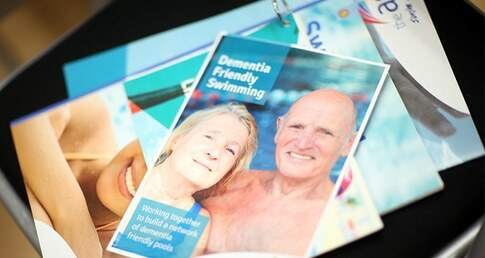 By developing guidance and training for facility operators and their staff to ensure the needs of those living with dementia and their carers are fully understood, and creating the right environment in which to deliver a range of low intensity exercise and swimming sessions, the project aims to encourage more people living with dementia to go swimming and take advantage of all the benefits that it offers. “This new project will help improve the quality of life of people living with dementia and I am proud that we have been able to work alongside ASA to be one of the first cities in the country to provide dementia friendly swimming sessions. “Manchester has fantastic local pools, recently a state-of-the-art leisure centre was opened in East Manchester and in the very near future new facilities will open their doors at Hough End and in Levenshulme. It’s important all Manchester residents have access to all our centres and these new sessions are a prime example of how we can cater for the diverse needs of local communities. “This is a fantastic opportunity for people with dementia and their carers to help maintain a healthy and active lifestyle. “We are promoting the swimming sessions with all our service users and working closely with the partners in the pilot project to make this a success that can be rolled out to pools across Greater Manchester. The launch follows the start of dementia friendly swimming sessions at East Manchester Leisure Centre, the flagship centre for the Project. Over the next twelve months, the project will be rolled out to Wythenshawe Forum, Moss Side and Manchester Aquatics Centre. It is hoped that by 2017 dementia friendly swimming sessions will be introduced to all local authority owned pools across the City. To find out more about the sessions being run in Manchester please email: catriona.sudlow@swimming.org. To read more about the national project, please click here.